Tata Daewoo has, through its local distributor Motorcity, launched a range of new medium- and heavy-duty Daewoo Trucks in Bahrain to cater to the growing demand for the Korean brand. Motorcity is a key distributor of passenger and commercial vehicle brands in the country. The new range includes trucks with multiple applications including materials handling and transport for the local market. Featuring a rugged construction, the trucks are available in long-wheel base and can be mounted with various applications to suit the requirements. Another key feature of the range is the state-of-the-art fuel injection system that squeezes the maximum power out of each fuel drop. Combined with its abundant cargo hauling capacity, Daewoo trucks present a highly efficient solution for transporting large cargo loads. The new Daewoo trucks are also available with factory-build applications like tanks, crane-mounted trucks, garbage haulers, jetting units and concrete pump solutions. Waleed Kanoo, chairman of Motorcity speaking at the launch. According to Sudhanshu Shekar, export general manager of Tata Daewoo, there are more than 20,000 Daewoo trucks in the region and the figures speak for the brand’s popularity. He says Daewoo trucks are known for high performance and quality, which places them in the league of the best in the business. “What we focus is on the cost of ownership, which means the price of the vehicle, operations, fuel economy and spare parts prices. So overall, it’s a more economical proposition for the customer,” says Shekar. 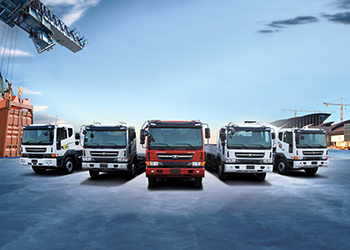 Daewoo trucks meet the standards laid down by GCC Standardisation Organisation (GSO). Another advantage is their mechanical engines, which aid in bringing down the cost of maintenance, says Shekar. Mechanical engines are easier to maintain and repair than electronic controlled ones. He says the main production facility for trucks is in Korea but there are assembly plants in South Africa, Kenya, Russia and Pakistan. According to Shekar, there are plans set up an assembly plant in Saudi Arabia as well as one in Nigeria in the future, he adds. 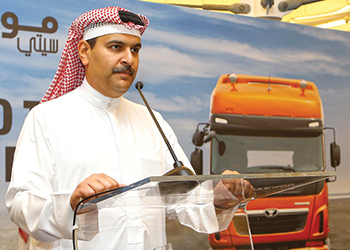 Daewoo trucks have been in the region for the last two decades and were recently launched in Saudi Arabia and Qatar in a bid to penetrate the local market there. They have been in Oman and the UAE for more than 15 years and 10 years in Kuwait. Motorcity’s new showroom in Maameer. Korean automobile company Daewoo Trucks was re-launched in 2004 after Indian automobile manufacturer Tata Motors bought 100 per cent stake of the company. It has production facilities worldwide and sales in more than 70 countries through 300 dealers. Shekar says Tata’s contribution to Tata Daewoo has been in increasing its global footprint. In quite a few countries, both Tata India and Tata Daewoo use common distribution networks. 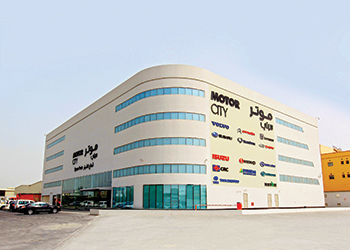 Meanwhile in Bahrain, Motorcity has inaugurated its service facility and central parts depot in Maameer to serve customers of all brands under the company’s umbrella. The facility will be an added advantage for Daewoo Trucks customers, whose vehicles will get all the care required. Kumar says the multi-storey centre covers 7,000 sq m for spare parts warehousing in addition to a 10,000-sq-m service centre area for repair and servicing of vehicles, and has more than 200 staff working in the after-sales department with separate counters for passenger and commercial parts.